All Brisbane roads seemed to lead to Southbank yesterday. Most people were headed towards Grey Street where a royal frenzy was taking place over some British tourists. My destination was nearby but more sedate, the reading room of the State Library where I looked out over the Brisbane River, dazzling in the April sunshine. I was there to take notes from a book, Thom Blake’s A Dumping Ground: A History of the Cherbourg settlement. The book covers the first 40 or so years of the settlement and the small town in the South Burnett has interested me greatly in 2014. I’ve been there twice this year and will be back a third time next Sunday for a “reconciliation fun run” which in my case may be practical reconciliation or impractical given my recent poor exercise regime. Reconciliation is an odd theme for a fun run, but Cherbourg is not a run of the mill town. It is Queensland’s oldest surviving Aboriginal reserve, and is still home to over 1000 mostly Indigenous Australians. It has its own Aboriginal shire, alcohol restrictions, and is not without the problems that plague many Indigenous towns like high unemployment, crime and bored kids (all inter-related). There is only one road in and out of Cherbourg, a relic of a time not long gone when Aboriginal lives were managed completely by white officialdom. Cherbourg has a dark past but has survived as a strong outpost of Indigenous culture. It has a strong sense of dignity, most notable when it celebrated its 100th anniversary in 2004. There are great people there like Aunty Sandra Morgan who turned the dilapidated old ration shed into Australia’s finest Indigenous museum. I was engrossed by the ration shed when I went there in February and I promised them I would be back for the fun run. It speaks to a community with a future as well as a past. It is a long and often difficult past, stretching back into the 19th century. It starts in 1895 with Archibald Meston, a former politician, a journalist, a businessman and a self-proclaimed expert in indigenous affairs. The frontier wars were mostly over in Queensland but the question was what to do with landless Aboriginals that survived the slaughter. Meston claimed he wanted “save that unhappy race” and his solution was to create two new reserves, one in southern Queensland, the other in the north. The watchwords would be control and discipline, and it would involve complete isolation from the white population. Queensland had tried reserves but failed and authorities were not keen to try again. They asked Meston to examine the work of the missions and report back. In 1897 Queensland enacted a law with profound consequences for Indigenous people. The Aboriginal Protection and Restrictions on the Sale of Opium Act, became so emblematic of the state, it was simply known as the Queensland Act. “Protection” sounded like a good thing but section 9 of the Act gave it menace with the Home Affairs minister authorised to “remove” Aborigines to reserves in the district. Once these reserves were established, the Minister would do the removing with Meston looking over his shoulder, believing stern measures were necessary for the “effective protection” of Aborigines. The first reserve was at Fraser Island, with 51 Indigenes removed from Maryborough. The island proved an administrative nightmare, and after three years it was handed over to the Anglican Board of Mission. Cherbourg (originally Barambah) was first mooted in 1899 by Salvation Army missionary William Thompson. Thompson lived in Nanango, in the growing South Burnett region. The first two reserves he proposed were blocked by settlers who didn’t want Aboriginal neighbours and the railway board who needed the land for the South Burnett line. Thompson found a 2800ha block at Barambah Station, and the reserve was gazetted in 1901. He persuaded local Wakka Wakkas to settle there and the government gave 60 more when they closed down Durundur camp, after complaints from Woodford residents. Thompson was more interested in saving souls than improving primitive conditions and there were no provisions and just tents for houses. In September 1904 Thompson was incapacitated after a horse-riding accident and he handed control to the government. The 100th anniversary celebrated this date not Thompson’s start in 1901. The government hired former Durundur superintendent, Albert Tronson, to be new superintendent at Barambah. Tronson did not have Thompson’s religious scruples and was determined to make the new reserve work. Drawing on lessons from Durundur, Tronson made Barambah economically self-sufficient. Despite over 800 hectares of arable land, Tronson felt agriculture wouldn’t work but saw an opportunity in the explosion of new white settlers to the region. Tronson put his workforce at their service and the South Burnett grew wealthy with cheap black labour. Demand for Barambah workers exceeded supply. Many whites did not like the large concentration of native Australians and the Kingaroy paper denounced the government for sending “notorious and scoundrelly aboriginals” to the region. But the government was delighted by its success and by 1910, Barambah was mostly self-supporting with a population which surged from 300 to 1000. As long as they were working, Tronson’s laissez faire approach meant there was little unrest and a lot of freedom of movement. That changed with the appointment of a new Chief Protector of Aborigines JW Bleakley. Bleakley believed in isolating blacks from whites and promoted removal to the reserves. People from all parts of Queensland, and some from Cummeragunja in southern NSW ended up in a pot-pourri of nations at Barambah. Some were removed for ridiculous reasons like the two Coen women ‘dangerously affected by the moon’, while Taroom residents asked for the removal of half-caste Carbo who went frequently through the town “mixing with members of our little community.” Refusal to work for whites was a common reason for removal. Laziness was not tolerated and Cherbourg, and later Palm Island and Woorabinda were where Aboriginal criminals finished their sentences. Bleakley made sure the primary purpose was to reform, subjugate and dominate inmates. Bleakley’s mission was not entrepreneurial so he did not care about Tronson’s system of outside work assignments. Bleakley preferred to keep Aborigines on the settlement but because they were indispensable to the South Burnett economy, many continued as semi-slave labourers. Bleakley’s purpose was to shake all remnants of Aboriginal culture out of them, so he set up children’s dorms away from parents and their native ways. The lack of learning had the opposite effect. Children filled the gaps with lessons in their own culture, handed down in secret. School was meant to instill the virtues of cleanliness, discipline and order. There were weekly inspections where any trace of dirt was punished. It wasn’t clean enough to keep away Spanish flu in 1919 and there were 143 deaths in 1000 people – seven times the Australian average. The death rate remained high in the 1920s due to non-existent sewerage and poor diet. In 1918, authorities paid for a reticulation system by withholding Aboriginal salaries, but for 20 years it only covered the hospital. The food was atrocious and the superintendent admitted buying lumpy meat unfit for whites but hinted blacks should not turn their noses up at it. Doctors visiting the settlement condemned the appalling diet but their protests fell on deaf ears. From 1901 to 1940, people in Barambah were four times more likely to die than the average Australian. Renamed Cherbourg in 1931, it suffered badly in the Depression, with demand for labour falling away. Workers had most of their wages confiscated. One-fifth went to administration and in 1930 there was an additional 5% levy for improvements to the reserve. The stolen wages were paid into trust accounts managed by whites who used the funds to do further maintenance or line their own pockets. The blacks were left with pocket money and were encouraged to barter for services. They wouldn’t dare ask about wages, which was ‘cheeky’ behaviour leading to jail, or worse still, removal to another settlement. Cherbourg blacks lived in constant fear of being sent to Palm Island or Woorabinda, and similar threats existed at the other two settlements. All mundane tasks on the settlements were done by inmates minimising the cost to the government. The aim was to strip inmates of respect and dignity, and create a cheap and compliant labour force. Freedom of movement was restricted, unless they had the ‘dog tag’ which allowed some rights but required papers, which could be inspected and removed at any time. No-one could own property. World War II brought renewed optimism but it was crushed again in the assimilation of the 1950s. Queensland had the strongest reserve system in Australia but it was also the slowest state to react to decolonisation. The Queensland Act was abandoned in 1965 but restrictions on freedom of movement were not lifted in Cherbourg until 1972. By then the local MP, a strange, awkward New Zealand-born Danish Lutheran named Joh Bjelke-Petersen had become accidental premier of Queensland. Joh claimed Queensland’s Aborigines lived “on the clover” and would become as rich as the sheiks of Arabia. His constituents in Cherbourg have yet to see the oil. According to Sandra Morgan, they saw Joh once every three years, looking for the settlement vote. He also used Cherbourg workers on his farm at Bethany who were paid, said Morgan with a wry smile, “peanuts”. Today Cherbourg is run by its own shire council. Like many Aboriginal councils it has been plagued with problems and has a small talent pool. Sandra Morgan should be on that council as a strong woman and a terrific role model for the region. Morgan was born and raised on Cherbourg with strong links to the Bwgcolman culture of Palm Island through her husband. Her vision led to workers rescuing the old ration shed and moving it up the hill to renovate it as a museum. 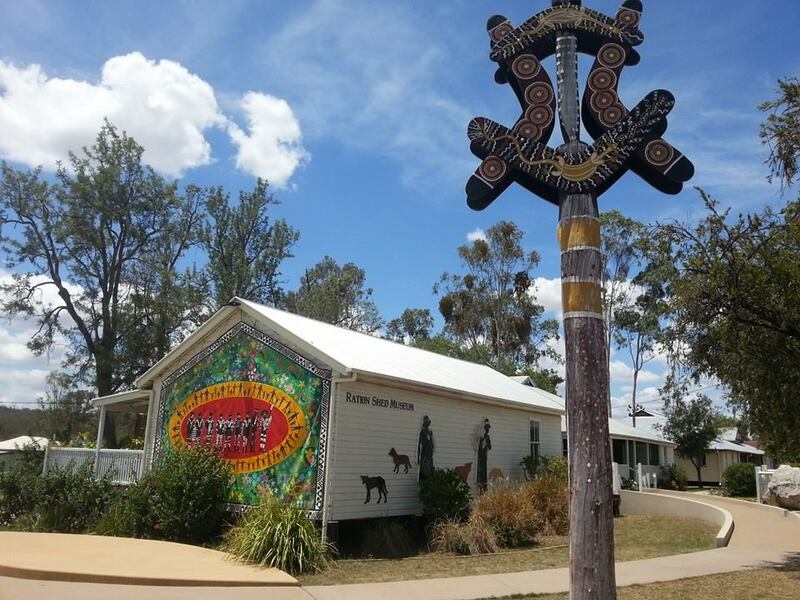 “We used to get food here,” Sandra told me, “now it’s food for thought.” The ration shed museum stands as in proud testament to Aboriginal culture, something Europeans tried to kill at Cherbourg and failed. I’m looking forward to the pain of a seven kilometre run there next Sunday. Earlier this year I wrote a Treaty was needed to address injustices of Australian colonisation, a view supported by Indigenous scholars (McGlade 2004, Brennan et al 2005). However, Tim Rowse’s useful model (2012) of Indigenous Australians as “populations” and “peoples” gives me hope for the proposed constitutional preamble. Measurement of Indigenous populations’ life indicators enable governments to “close the gap” on health and education. But as peoples they have a need for recognition as First Australians. This is why I now give cautious support for Prime Minister Abbott’s call for a preamble in the 2014 Close the Gap report. A 60,000-year-old society was destroyed in 150 years following Cook’s 1770 act of possession (Indigenous oral historians still give prominence to Captain Cook’s role). Indigenous people resisted occupation but Britain never acknowledged war and Australia never acknowledged its end. Survivors became fringe-dwellers as conscience-stricken whites comforted themselves by “smoothing a dying pillow”, as they did in other settler countries. Australia defined itself by whiteness and boundaries of race but the 1967 referendum and 1971 census began the repair of Aboriginals as measurable populations. They now seek recognition of identity with the land to overcome the effect of racism which remains in the criminal justice system. Real wars have been replaced by history wars but the “usurper complex” positioning whites as victim, still flourishes. This review examines two texts to see how the need for justice could inform a preamble – frontier reports from 1839 looking “through their eyes” (Lakic and Wrench 1994), and a 20th-century look at the “contested ground” (McGrath 1995) of Australian historiography. The year 1839 was a watershed on Port Phillip’s frontier. By 1835 the law of terra nullius gave carte blanche for whites to steal Indigenous land. That same year the government repudiated Australia’s only Treaty at the cost of opening up the country to settlers. Australian exports expanded 25 times between 1825 and 1840 and wool’s high price attracted European settlers while removing original inhabitants from camps and waterholes. Myall Creek’s 1838 massacre showed settlers did not consider killing Aborigines a crime while the subsequent trial made them quiet about their conquests. The government hired Chief Protector George Robinson from Tasmania to put a humanitarian gloss on outright theft. His assistant protectors Edward Parker and William Thomas enforced what they called Britain’s “benevolent designs” with Parker’s job to track down guerrilla leaders. They regretted the inevitable outcome but their solution to Robinson was not to stop white crimes but remove Aboriginals to reserves or else bring in native police. The first path led to Coranderrk where radical hopes were quashed by greedy settlers, while native police, especially in Queensland completed colonisation’s dirty work. Parker and Thomas were writing official reports not history, but their words are a damning indictment of settler behaviour. By 1995 the battleground had moved to books where Stanner’s “great Australian silence” was replaced by “Black Armband” history. In 1987 Ann McGrath wrote of Indigenous survivors “born in the cattle” but controversies over Australia’s Bicentennial a year later widened her focus. Tiga Bayles told the Day of Mourning protest that “asking Aborigines to like Australia day was like asking Jews to celebrate the holocaust”. Whites stole their land and their history, thus McGrath’s historiography begins with a Bicentennial history book flung into the harbour as scornful First Australians talked of their “200th bicentenary”. Aboriginal stories were expunged from Australian history which became a story, in McGrath’s words, of Europeans “discovering, exploring, settling, [and] fighting”. Winners wrote the history which ignored Aborigines entirely. McGrath acknowledged her sympathetic role as an expert witness in land claims and as a “white female historian, trained in the academy of the liberal humanistic traditions”. She was writing long after the Civilising Mission of Robinson and his men but her “questions of the dead and the living” are just as much demands for colonial justice. There is a direct line between 1839’s events to those of McGrath’s world in 1995 which cascade on to 2014. Though “usurpers” still deny problems, the enormous 19th century gulf between white and black was recognised by the end of the 20th. Governments responded by “closing the gap” but if the 2014 Closing the Gap is to be meaningful it must address issues that affect Indigenous Australia as “peoples” as well as “populations”. The Prime Minister’s preamble might do that if tackles issues of identity and justice. To get there, we must carefully but openly examine the history in documents like Lakic and Wrench, and McGrath. Only then can we move beyond contested ground and find a meeting place of black and white.